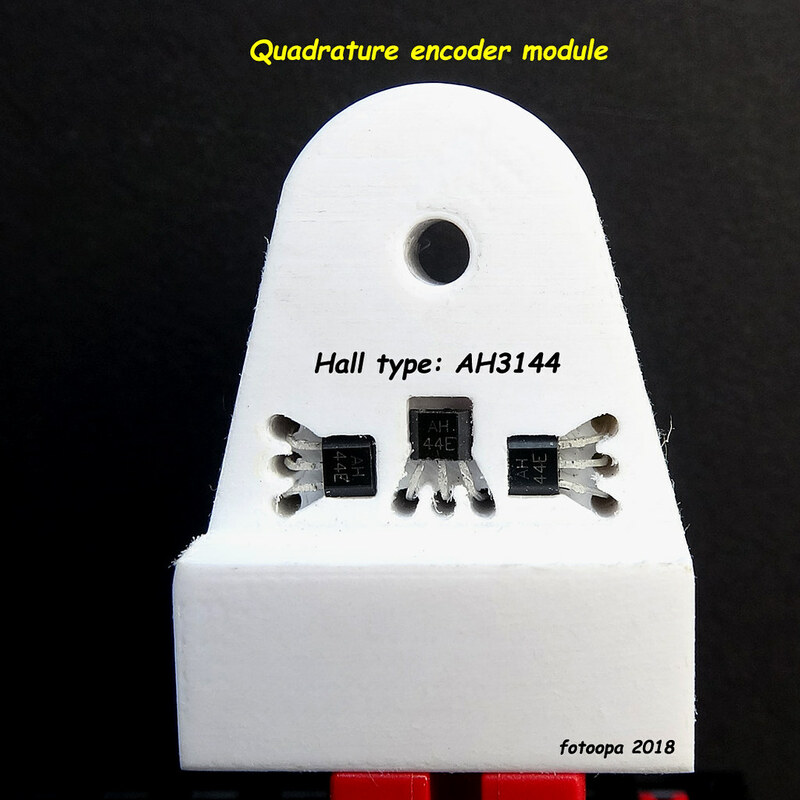 First realization of a quadrature decoder module, 3D printed. The module contains a magnetic disc and a holder with the decoder built in. No adjustment is required, due to the correct shape and dimensions the encoder signals are according to the quadrature standard. I have chosen an open housing, only the right side is provided for the 4mm shaft support. 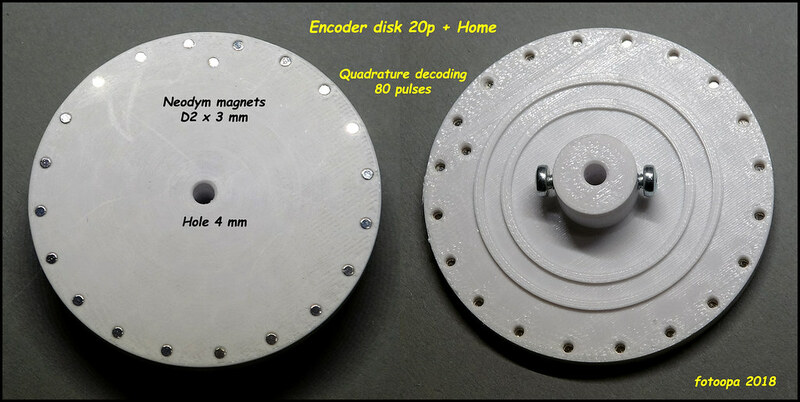 So you can easily mount the magnet disc, the distance to the decoder flange is not critical. I've mounted a distance ring of 0.8mm between flange and decoder but this can be even more. The hall magnets are not critical as they are magnetically strongly coupled. The logic analyser is connected to the output signals of the hall. These outputs are open collector type and fit easily on most interfaces. The power supply voltage can be between 3V3 and 24V, so also ideal for the FT controllers. I use 5V as power supply and on the outputs comes 3K3 as pullup resistor. This comes standard from my own SPI interface box. As can be seen on the LA, the quadrature signals are nicely rotated 90 degrees in phase and the homepoint also coincides nicely with one of the flanks of encA. First I had made a disc for 12 magnets on this diameter but after measuring it appeared that the hall distance was not correct to get a symetric pulse. Because of the diameter of the neodymium magnets, 2mm, the distance between each next magnet is actually determined. This distance is 2.88*pi = 9 mm. When designing the encoder disk you should take this into account. Both halls must be at 1.25x the magnet distance (11.3 mm). These values are for a good magnetic coupling, this is necessary to obtain a stable signal even at high rpm. The LA gives a rotation speed of over 3850 rpm but the XS motor, directly coupled, can go up to 8500 rpm. To connect the XS-motor I drilled a FI-35073 block over 7.5mm length so I could press it on the end of the motor. If you want to use this high speed it is better to mount a small ball bearing. I use a bearing of D8xD4x3mm for this. I will make a version later where this bearing will be directly printed in 3D in the decoder flange. Note these last images were still with 12 magnets on the disk, the new version has only 10 magnets on it. Everything is drawn with Autodesk Fusion 360 with parameter design. This way I can quickly make any type of disc with more or less magnets. The output is a .STL file that goes to my FlashForge Finder printer. I use the glue supplied as standard so that the objects do not come loose during printing. The material used is PLA at 210 degrees. I also use a Brim around the objects and the print speed is 60. I use a 30% fill. This is my first real project with 3D printing. I still have a lot to learn but what's nice is that the results are very good from the start. I have no wrong prints. I still have to make all the data available via Thingiverse. Magic Frans strikes again. Impressive! PHabermehl hat geschrieben: Magic Frans strikes again. Impressive! I had forgotten to mention that if you only mount 1 hall in the housing you can use the encoder as a regular pulse encoder. This is especially true for the TXT Controller where they do not support quadrature decoding and certainly not at slightly higher speeds. With 1 hall AH3144 for example on channel A you have enough. I just ordered 400 pieces D2x3mm. Soon I will draw the small PCB layout. This will make the assembly even easier. The prototype I made on holes PCB print grid 2.54mm. 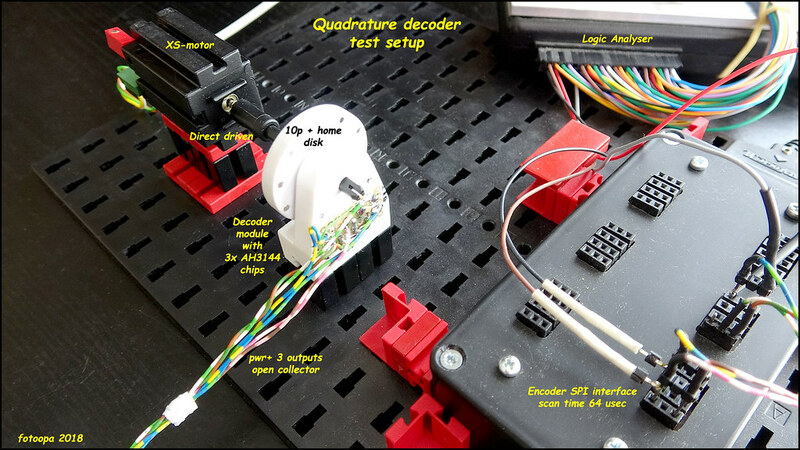 With a single PCB version you can mount 3 decoder types, one as a regular pulse decoder, one as a quadrature decoder and the 3rd type as a quadrature decoder with home point. Other encoder versions will follow. 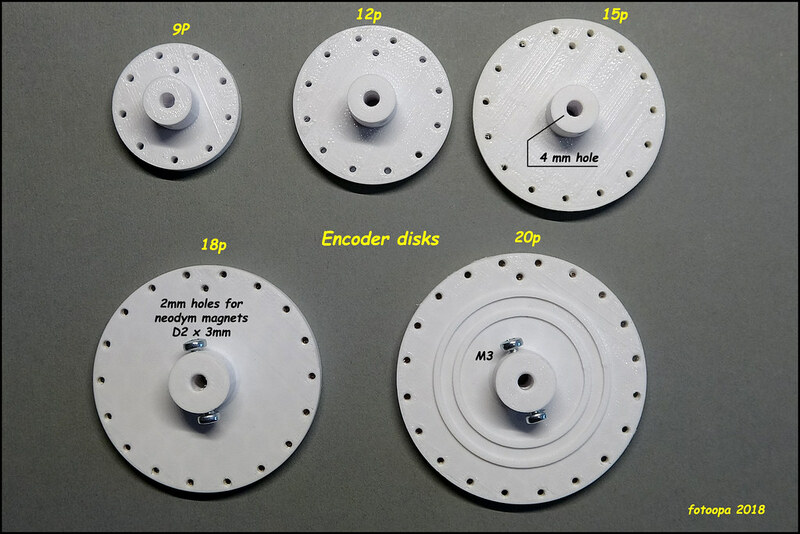 I make more designs to mount the magnetic disk directly on certain gears. (Click system). Because of the larger diameters more magnets can be mounted, so more pulses per tour. 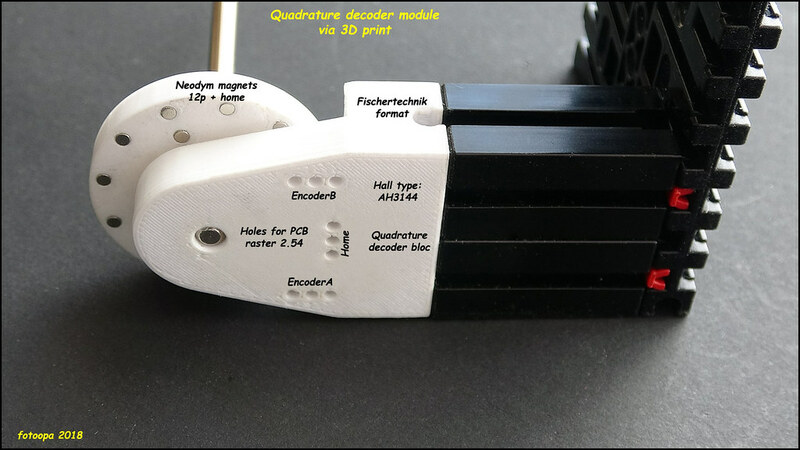 If you use quadrature decoding you get a resolution of 4x the number of magnets used. As an example the version with 10 magnets gives 40 pulses per revolution. Impressive indeed, Frans! Hope to see it soon on thingiverse. What measurements did you use for the 4mm ft groove? Did you also use a drill to make this fit? I prefer to take these holes a little too small so that they can be adjusted to the right size with a drill afterwards. That's perfect for the encoder disc, which clamps to the shaft but you can just move or twist it a little. It doesn't need to be fixed extra. For holes that need to be less accurate I print 0.3mm larger holes. 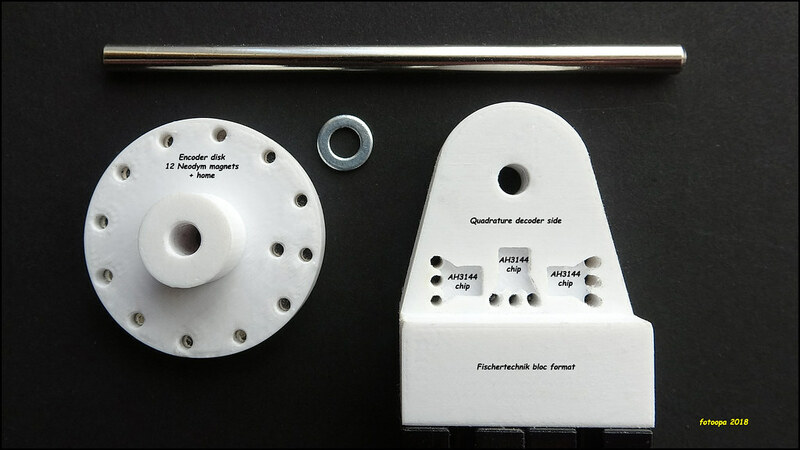 To let a 4mm shaft pass without friction you may print with 4.3mm. If it is a real bearing, I draw the right size, 4mm, and afterwards I drill the hole with the 4mm drill. If you afterwards drill out with 4mm then the object clamps on the shaft. If it concerns a rotating bore I drill it out with 4.1 or even 4.2 for plastic shafts FT types. Truly custom printing is critical and depends on your printer type and settings. That's why I prefer to drill out bearings to the correct size. I have a complete drill set of 1 to 10mm per 0.1mm increments. The long grooves like a 15x30 block there I use 4.3mm without post-processing. Then an shaft of 4mm goes in loose. I still have to optimize and rearrange some things. I had made several test versions and sometimes you would confuse them. That is why they are not yet online. By the way, I have only been busy for a few weeks to use all these new programs. Especially Autodesk Fusion 360 is quite a challenge to learn. But it works pretty well anyway. Fortunately, the printing itself is now going perfectly well so that no bad parts come out of it. You should also learn to optimize how best to place a piece to print so that less support is needed. My head is full of new ideas! 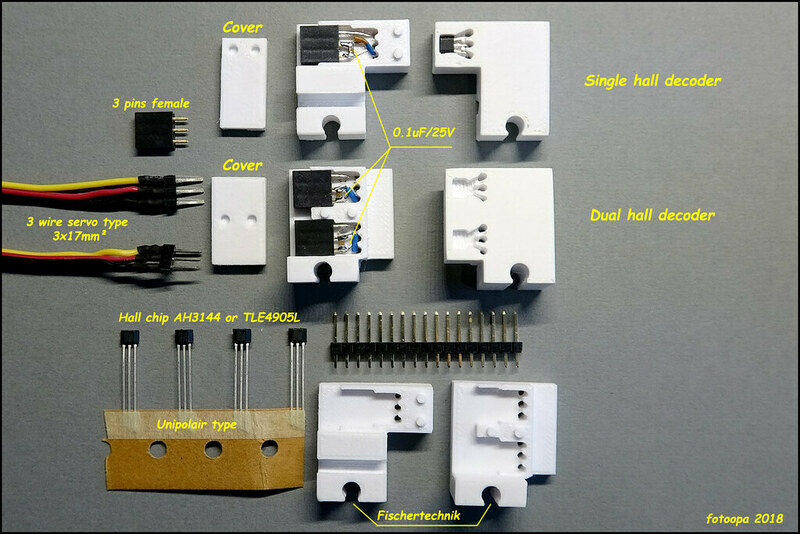 This is a single hall sensor detector Fischertechnik format. Can be used for encoder disks or just as end switch. Power supply 4.5 to 24V ouput open collector. Standard 3 pins connector output. The hall ship is internally protected if you should connect incorrectly. A 100nF/25V capacitor is also soldered internally in the housing. The 2 round pins are to mount a small cover. This will be drawn and printed in 3D. This way the sensor is completely shielded. 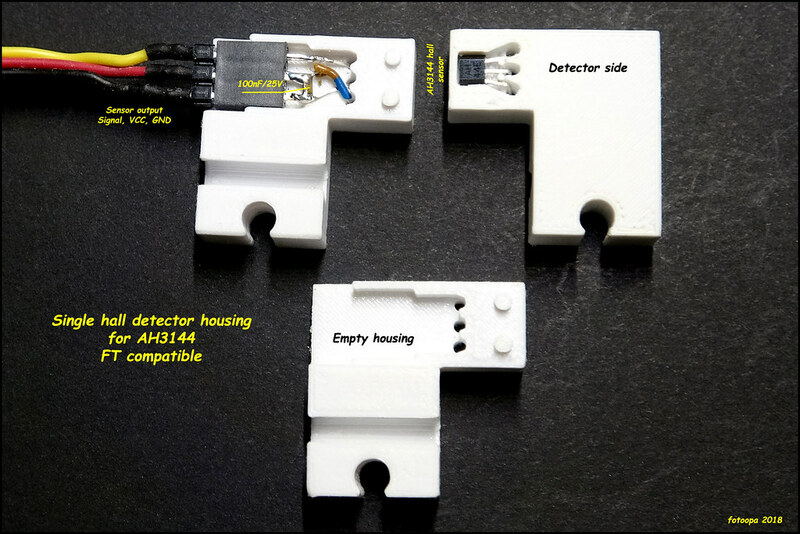 The assembly is so easy that you don't have to make PCBs. 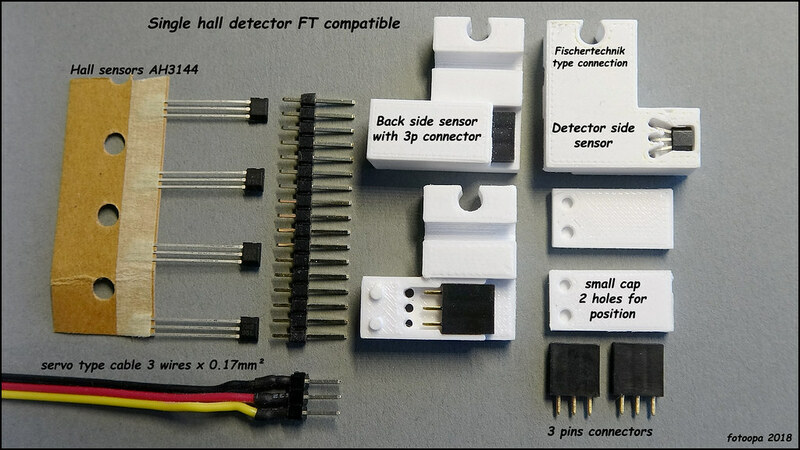 Overview of the parts for the single hall sensor detector module. There is also a small cap added to shield the whole. With 2 small pins/holes the cap fits just on the housing. I use the servo type 3x0.17mm² colored wire for the connection. The chip is internally protected for wrong polarity. If you connect incorrectly, it will not work but it won't break anything. The standard 3 pole female connector fits perfectly in the housing. Inside are 2 twisted wires (GND,VCC) to get the same connection to the connector as servos are connected. GND, VCC, Output. The 9V from the TXT Controller fit perfect, the output is open collector type and may be connected directly to the controller input. The dual decoder module is made to fit all disks. There are built-in 3 pole female connectors for the connection. If you need a home point you can use the single decoder module. Mounting is Fischertechnik compatible. All holes must be drilled to the correct size. The Neodym magnets D2x3mm can be pressed in nicely. The hall chips are unipolar, note the magnet polarization!